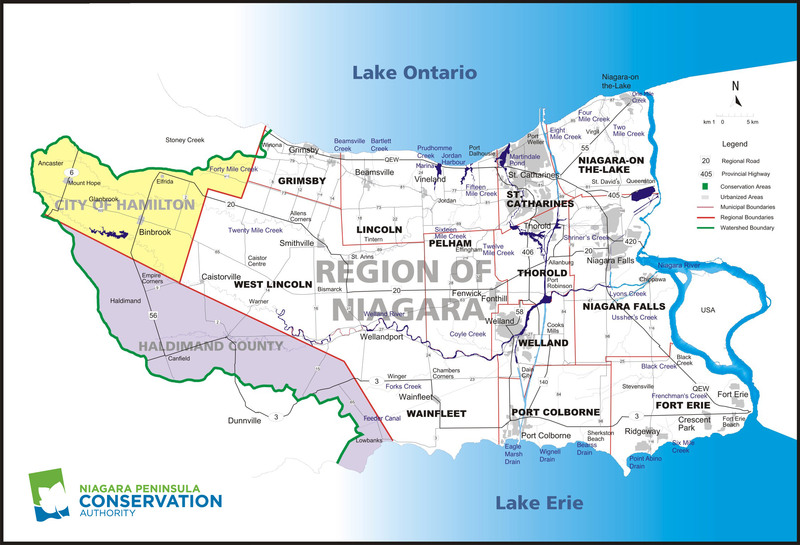 The Niagara Peninsula Source Protection Area (NPSPA) is located between Lake Ontario and Lake Erie, and covers the same area as the Niagara Peninsula Conservation Authority (NPCA). The NPSPA is 2,424 km, squared, in size, and the jurisdiction covers the Regional Municipality of Niagara (Regional Niagara) and approximately 20 percent of the City of Hamilton and 25 percent of Haldimand County. There are also 12 second tier municipalities located within Regional Niagara generating a population of around 450,000 people. Municipally serviced areas in the Niagara Peninsula are generally restricted to the larger developed urban centers, however a number of villages are also serviced by municipal water, such as Jordan. Serving approximately 392,000 people, each of these systems is considered a large municipal residential system as defined by O. Reg. 170/03 (Drinking Water Systems), under the Safe Drinking Water Act. It is estimated that approximately 15% of area residents rely on private wells or other sources for their drinking water. Intake Protection Zones (IPZs) are one of the four vulnerable areas defined in the Clean Water Act and must be identified. IPZs are the designated protection area around the raw surface water intakes of the WTPs. IPZ delineations and vulnerability scoring for the six WTP intakes are being completed in accordance with MOE technical rules. The Niagara area has a moderate climate, and is best known for its tender fruit and grape production. The area is also characterized by abundant surface water sources including Lake Ontario, Lake Erie, the Niagara River and the Welland Canals. The topography in the Niagara Peninsula ranges from its highest elevation of 260 meters above sea level (mASL) in the central portion to its lowest at Lake Ontario.